Please visit our web page directly to see more current entries, and thanks for reading! Green Venture is getting ready for their first EcoStar camp! With topics like Bugs & Blooms, H2Whoa that’s a lot of Water, and EcoExplorers, campers are sure to learn new skills and an appreciation for the environment around them. As camp director I’m excited to introduce our two camp counselors Bright Eyes and Dandy. My name is Bright Eyes, I’m the Environmental Programs Assistant and Camp Counsellor for EcoStars! I’m so excited to meet all of my campers and spend my time in the great outdoors. I’ve been living in Hamilton for three years now and can’t get enough of the hiking and waterfalls; needless to say, I’m pretty stoked for our hiking trips. When not hanging from the side of a tree you can find me in our crafts room (where the magic happens). I’m hoping to kick-start some really awesome art projects this summer, and will definitely need some campers that aren’t afraid of getting their hands dirty. I study science at McMaster, and have fronted some neat science projects at past camps. I’m really excited to bring these experiments to EcoStars, and add an environmental twist! Although I am new to the Green Venture family this year, I already feel accepted and proud to be working with such environmentally-forward individuals. I’m now even more excited to welcome our campers aboard, and cannot wait for camp to begin! My name is Dandy and I am super happy to be a part of the EcoStars camp this summer! I study science at McMaster so I love to analyse things and figure out exactly how they work. I am especially stoked for the “Bugs and Blooms” week because I like learning about how animals, insects, and plants interact with each other. My favorite tree is the Willow tree and my favourite animal is the Cheetah. I am an avid hiker, paddler, and skier. I recently started bird watching and I hope to learn some bird calls during the time spent outdoors at the camp. I first became interested in the idea of sustainable living when I saw An Inconvenient Truth as a kid. Being a counselor at EcoStars camps gives me great chance to share my knowledge concerning sustainability to the leaders of tomorrow all while having a blast in the great outdoors! The camp takes place at EcoHouse in east Hamilton, and there is a cost of $175+hst per week. For more information or to register, visit greenventure.ca, email education@greenventure.ca, or call 905-540-8787 x154. Depave Paradise projects engage volunteers and neighbourhoods in communities across Canada, removing pavement and planting gardens filled with native species in its place. Hard surfaces, such as driveways, parking lots and buildings, interrupt the natural water cycle by preventing rain water from soaking into the ground. This in turn leads to flooding, poor water quality, and creates urban heat islands that are warming up our cities. By removing pavement and replacing it with green space, we are increasing the infiltration rate of rain water, cooling our neighbourhoods, keeping our water clean, and providing us and our children with greater connections to the natural world. On May 28th and June 4th, we helped R.A. Riddell Elementary School, partners and local residents host Hamilton’s 3rd Depave Paradise event to transform part of the school’s asphalt playground into a beautiful garden – and it was a great success! On Saturday, May 28th, volunteers showed up at the school in over 30 degree weather (!!!) to help rip up the asphalt from the school’s playground. We worked with Fern Ridge Landscaping and Eco-Consulting to make the school’s vision a reality and they were busy from May 30th – June 2nd preparing the new garden space and installing permeable pathways. On Saturday, June 4th, volunteers headed back to the school to plant a new garden in the de-paved space. Funding and support for this project has been provided by the Green Communities Canada, the Ontario Trillium Foundation, RBC Blue Water Project, Intact Financial Corporation, Fern Ridge Landscaping and Eco-Consulting, HWDSB Foundation, EcoSpark, and the Small Change Fund. HAMILTON, ON – DEPAVE PARADISE (www.depaveparadise.ca) projects engage volunteers and neighbourhoods in communities across Canada, removing pavement and planting gardens filled with native species in its place. On May 28th and June 4th, Green Venture, R.A. Riddell Elementary School, partners and local residents will be hosting Hamilton’s 3rd Depave Paradise event to transform part of the school’s asphalt playground into a beautiful garden for the community to enjoy. “Hard surfaces, such as driveways, parking lots and buildings, interrupt the natural water cycle by preventing rain water from soaking into the ground” says Deirdre Connell, Depave Paradise Program Manager at Green Venture. “This in turn leads to flooding, poor water quality, and creates urban heat islands that are warming up our cities. By removing pavement and replacing it with green space, we are increasing the infiltration rate of rain water, cooling our neighbourhoods, keeping our water clean, and providing us and our children with greater connections to the natural world”. Bring your family and friends, young and old, and join R.A. Riddell and partners transform the schoolyard pavement into a vibrant and engaging green space for all to enjoy! “Community gardening and beautification projects like these are proven to increase sense of community ownership and stewardship, foster the development of community identity, bring people with various background together to work on a common goal, and help build community leaders” says Connell. Volunteers are needed! This is a family friendly event and all are welcome. We will provide all necessary tools and safety equipment as well as food and drink for all volunteers. Please arrive dressed for the weather (Rain or Shine! ), wearing sturdy closed-toe shoes and be ready to get your hands dirty. For more information about how you can get involved, visit http://j.mp/depave-riddell or contact Deirdre Connell, Program Manager at Green Venture at 905-540-8787 x 113 or deirdre.connell@greenventure.ca. Funding and support for this project has been provided by the RBC Blue Water Project, EcoSpark, Green Communities Canada, Intact Financial Corporation and the Small Change Fund. What do you get when combine your life’s passion with an amazing team of earth-loving co-workers? …. Green Venture! My name is Chelsea and I am a new Educational Support Staff here at Green Venture. My background is in teaching children how to grow food and dig in the dirt. Working with kids is very rewarding (and at times challenging) and it is always nice to see a group of little ones exploring in the community gardens at Eco House. There is so much to see, from the pollinator gardens to the community plots to the Red Wigglers who help to feed our plants. The kids are excited and engaged and a lot of fun. We help them make connections to their environment through games and arts and trivia, which is fun for both the kids and myself. I have learned so much in the short time that I have been here and it’s nice to feel a part of the greater Hamilton community which is thriving and full of people helping to make our city a cleaner and greener place to live. Green Venture is an awesome place to work and Eco House is a little hidden gem to those who haven’t yet discovered it. Over the last few weeks the kids and I have been in the garden weeding, planting, and watering. Have you noticed what a dry spring we have had? 1. Get a rain barrel! When it does rain you can store and use this free water (which plants love) to hydrate your garden. 2. Spread a couple of inches of compost or composted manure on the garden in the early spring. Don’t worry; it’s not too late! At the same time, moisten peat moss in a bucket or wheelbarrow until it is thoroughly soaked. Spread peat moss over the garden. Compost and manure add nutrients to the soil and also improve its texture so it uses water more efficiently. Peat moss can hold up to 20 times its weight in water, making it an excellent addition to a dryer garden.Layer the compost and peat moss onto the soil and lightly mix. 3. Add a few inches of mulch to the surface of your gardens. Not only does it help to keep the soil underneath moist but also it keeps the unwanted invasive plants and weeds out of your garden naturally. 4. Remember to take your kids out to the garden with you. They are great little helpers and usually love to get dirty..
Stay tuned for more tips about natural gardening from the staff at Green Venture this growing season… Happy soil amending! Are you looking for a way to clean your home from top to bottom, with items you already have in your kitchen? We asked the staff for their top tips and tricks for Spring Cleaning, using no chemicals or toxic ingredients. Combining baking soda and vinegar is like magic. I use it to unclog (or prevent clogs) to my drains. Just pour ¾ baking soda down the drain, followed by ½ cup of white vinegar. Let it sit for 30 minutes, and then pour a full kettle of boiling water. Works like a dream, and it reminds me of making volcano science projects when I was kid – the reaction between the baking soda and vinegar is fun to watch! 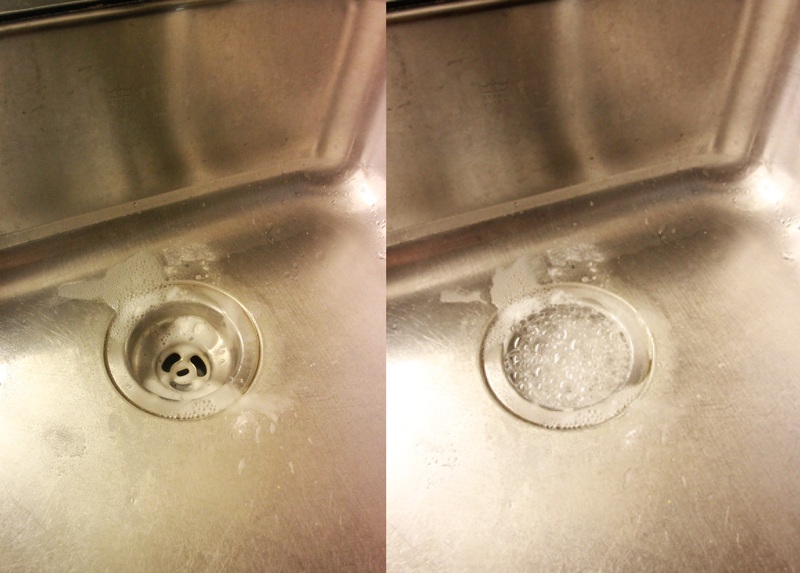 Watch your sink get clean as the vinegar and baking soda react! Vinegar and water are my go to cleaner. I mix equal parts together, and it works well to clean glass, floors, counter tops, or any other non-porous surfaces. If you need a bit of extra muscle when cleaning the bathroom, just add a bit of borax (not for mirrors or glass though). I do a lot of cooking and baking, so I find I need to clean my oven fairly frequently. My favourite trick is to sprinkle baking soda all over the floor of the oven, and then spray it with water until it’s damp. I walk away for a few hours, and then use vinegar to help remove any residue left behind. No scrubbing needed – this is really easy! Lemon juice and olive oil work really well to polish wood and furniture. Mix equal parts, and then gently polish with a soft cloth. It lasts for a few weeks and makes wood look shiny and new (and smells great!). Olive oil is really great for removing those pesky smudges and dirt from stainless steel too! I have a few tricks for air fresheners. Simmering cinnamon sticks on the stove make the whole house smell like you are baking a fresh apple pie. Or, another easy trick is to sprinkle essential oils on a few cotton balls, and stash these in the corner of a room. Just make sure it’s out of reach of children and pets. Do you have a tip or trick we haven’t mentioned here? Tell us about it in the comments, we’d love to hear from you! White Clover, EcoLawn, and EcoAlternative were planted as seeds. The Elfin Thyme was purchased in small established plugs. After the first month, White Clover and EcoAlternative were off to a great start. They sprouted up quickly and established well. Hardly any weeding was needed, as the growth happened so quickly. Both were lush and green, and needed to be mowed within a few weeks. On the other hand, the EcoLawn and Thyme were growing very slowly, and in constant need of weeding and attention. By the end of the summer, we were paying more attention to the EcoLawn. It had filled in to be thick and dense, and the vibrant green colour was particularly appealing. Aside from some early weeding (ok, a lot of early weeding), maintenance on this plot has been low and we haven’t needed to mow at all over the whole summer. As for the Elfin Thyme, it is still too early to tell how it will fare in relation to the others. We’ve spent the summer weeding because the plugs that we started with haven’t spread very far, and we expect it will take another two years or so until we see it filled in. On the plus side, because of its low profile, we know this one won’t need any mowing, ever. A quick staff poll indicates that the favourite so far is clover. Stay tuned for an update in the spring of 2016, and we’ll let you know how each of the alternatives fared through the cold weather.